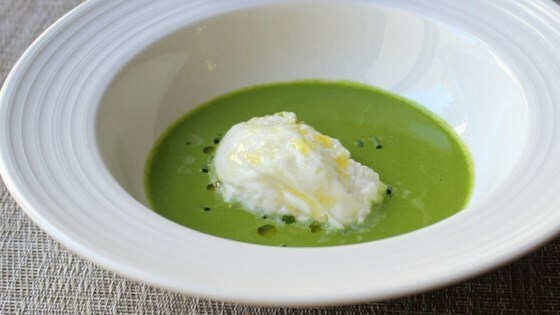 "This ice-cold, cucumber and herb-based gazpacho sets the stage for a scoop of creamy, gooey burrata cheese in this refreshing appetizer course." Rich cheese in a refreshing soup! One English cucumber yields about 3 cups sliced. If using regular rice vinegar, season to taste with salt and sugar. You can also use white wine or sherry vinegar, and do the same. First time having and making gazpacho. Who knew something so simple could be so good? My husband was pleasantly surprised too! I made this recipe as written and it was delicious! Served this as a prelude to Chef John's simple Chicken Parmesan for a dinner for six. Just as written. Easy - delightful - well received. Everyone enjoyed. Very light and refreshing! I used burrata with black truffles, and it was outstanding. Loved it!